"I think they've got it figured out now!" I'll start out by saying that this was my first time running this race, but since I live only a few hours from Milwaukee I heard about all the struggles from the last few years around this race. Under new management, the race was out to make things right with runners and bring a quality race. Early registration was inexpensive and I ended up having quite a few friends that traveled down for the race, which always makes races more fun! Packet pickup was at the Fiserv Forum, the new home for the Milwaukee Bucks. Since it was in the arena, everyone had to go through security to enter the building (Note: No backpacks, suitcases or large hard-sided bags allowed). We got downtown a little after 4pm, found parking at the nearby parking garage ($5 event parking) and walked the block over to the arena. There was a short line to get into the building but in the end, it only took us about 10 minutes to make it through. Packet pickup was a breeze! No lines at all! within 2 minutes after we were in the building, we had packets and shirts. Yes, SHIRTS - all runners received a tech finishers shirt and then half and full marathoners also received a 1/4 zip pullover with the race logo! One thing to note is that, unless you pay the extra for Race Day pick up, you MUST pick up your stuff on Friday night (or have someone else pick it up for you). The expo, if you can call it that, was small. Only a few vendors (I think most were also race sponsors) and a few other races were represented with booths. We made it through everything in about 5 minutes. I am hoping that in future years, this will grow to be a bigger expo, as that is part of the fun of going to races is checking out the expo to find new stuff! Race day!! We made our way downtown and found parking in the same ramp as Friday night, just a block away from the finish line. (NOTE: parking on race day is $20) We were there early enough that we were able to park on the 1st level of the ramp - no stairs to get to the care after was a huge bonus! Having the entire area in front of the forum gave everyone plenty of room to hang out and mingle. The end closer to the start line was a bit congested, but that can often be expected. One of the cool things about the start of this race is that the 5k actually started 30 minutes before the half and full. Was really kinda cool to watch the 5k runners finishing as we were getting ready to start. I would have to say that the most challenging part of the course was the climb up the hill on Water Tower! It is one of those hills that you really can't see the top as you start climbing because there are several turns to get there! Once you get past there, it's smooth sailing! The half and the full run together until you reach about mile 11.5 (on the campus of Marquette University). Here the full continues out further while those running the half head back towards the finish. FINISH LINE! once you cross that finish line, there are the usual post race treats... bananas and water. but this year we also got packets of granola from Supernola! We were able to try this granola at the expo and getting a bag of it at the finish was a nice treat! Then of course there is the medal! (this is why we all run right?) The medal this year was simple yet sleek. A nice addition to the collection! We wandered around the finish line area for a bit while we waited for some friends to finish who were running the full and then headed out. As we were waiting, we were pleasantly surprised to already get emails that we had race photos available! YES! Less than an hour after finishing, we had pics! And not just race pics - pics that we could download for FREE! There was an option to purchase the hi-res versions too, and that was only $2.99 - very reasonable for race photos!! All in all, I loved this race! I'd come back and run it again! And for those that ran it in years past - give them another try! "Nothing LITTLE about the Little Rock Marathon and half marathon!" I'm not ashamed to admit that I can be a bling junkie! 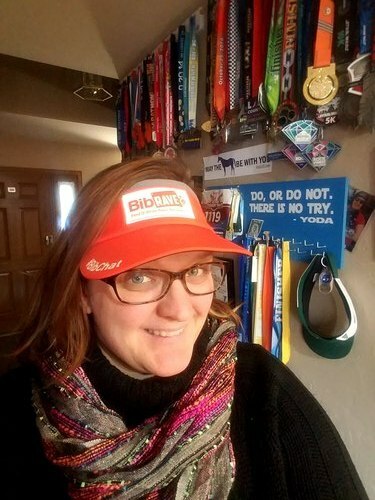 Give me a big, epic race medal and you better believe I'm heading to that race! Little Rock has been on my list since I first heard about it, and it's EPIC HUGE marathon medals! 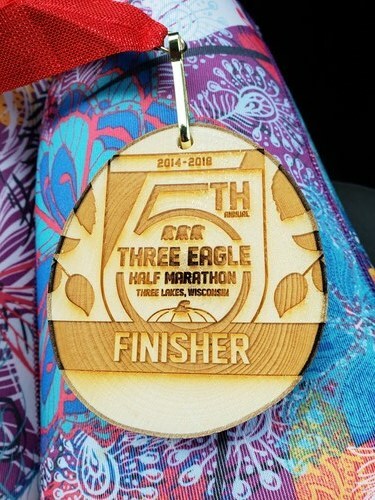 Ultimately, I would have loved to have run this full marathon to get that blinged out, extra large, glitter covered, glow in the dark medal that measured 8 INCHES across, but 26.2 miles was NOT in the cards for me for this one. This weekend was more about celebrating a good friends amazing accomplishment as she was finishing her 50 state marathon challenge. She was checking off that last 26.2 in LR and I wanted to make sure I was AT the finish line when she crossed. The expo itself has everything you need, and then stuff that you didn't think you needed! Like being able to play with goats! and awesome cookies from a local bake shop! Looking for your next race, there are plenty of other races set up with booths! RACE DAY: Since race day was blessing us with cool temps and rain, I was really not looking forward to waiting outside, for the race to start! We had a friend that was running the Marathon and taking the early start... as much as we love her, we opted to watch the start from our hotel room (we were at the Marriott and could see the start line from our window!) When it came time to head down, we were excited to see that they opened up the expo hall for runners to wait inside, away from the elements- complete with a bank of porta johns. Shortly before race time they made announcements to start moving people outside, based on which corral they were starting in. In the end, we only ended up waiting outside for about 10 minutes. RACE: As I mentioned, it was cool and rainy. This was the first time that I EVER started the race wearing a garbage bag (I forgot to grab one of my disposable rain ponchos from home). The course for the half marathon is a fun one. Few hills, but nothing that I would get too excited about (I hear that the marathon course has a few bigger hills tho). Meandering past the Governor's Mansion, the airport and the Clinton Library, as well as through some fun neighborhoods, the course keeps you going! I was running with a friend of mind that I only see a few times a year at races and we didn't let the rain dampen our spirits. We enjoyed each others company and the course and before long, we were nearing the finish line! THE BLING: be honest, this is why you are considering the Little Rock Marathon races. this race is knows for is EPIC race bling. 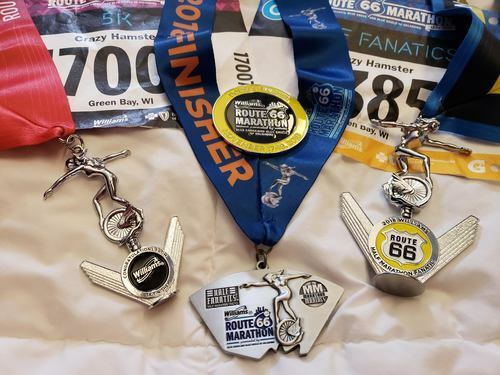 I will be honest, I was a little jealous of those 8+ inch Marathon medals, but the one for the half is nothing to joke about either. Best thing about this years? It covered all the criteria... BIG, bold, glitter, spinner and it glows in the dark! Jackpot! What will next years look like? No one knows. They don't reveal the medals until a few months before the race. OVERALL: Fun race! It's one of those smaller races with big race appeal. Will I go back and run this one again? Once I finish y 50 start half marathon quest... you just never know! "A must do for any marathoner!" 18 months ago, I had no intention of running another marathon. Then I was presented with the opportunity to run the TCS NYC Marathon thru Bibrave and knew that it was a race I could not pass up running. Running one of the 6 Major Marathons is always in the back of any runners brain and this has been true for me too. Since I was going in with less than 60 days to prepare, it was never going to be about a time goal. It was about running the NYC Marathon, exploring the city and enjoying the people! With so many runners, I was pleasantly surprised to breeze through packet pick up in a matter of a few minutes! This meant we had more time to wander through the expo, sample some free beer, pick up some freebie treats that would come in handy over the weekend and chat with other runners and companies that were there! After 49 years, they have race logistics figured out! Yes, we took a train, to get to the boat, to catch a bus to make the walk to the start village, but it was seamless! And yes, it really can take 3 hours to get to the start line, but since I wasn't driving, I really didn't care! The 1st few miles of the course contain the trip over the bridge to get off Staten Island, but once you get past that point, there is NO SHORTAGE of spectators! 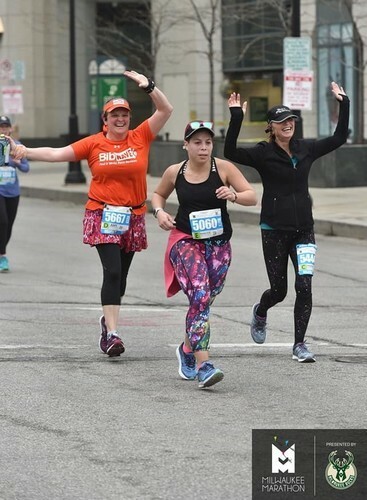 In many area, the sidewalks were lined 3 or 4 people deep with neighbors out enjoying the day, cheering on runners, giving high fives' and keeping everyone motivated! The weather was amazing - Thank you Mother Nature for cooperating! 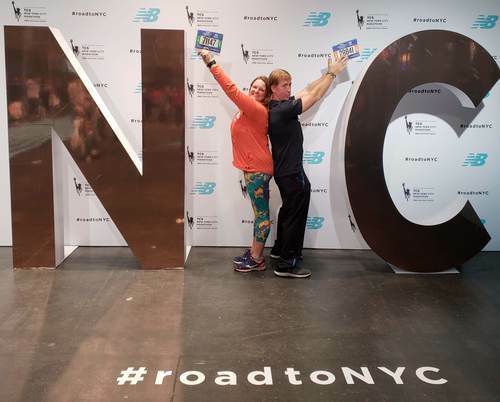 Will I try and get back to NYC to run the marathon again? You better believe it! The first time was for fun, next time, it for time! "A must do race in my book!!" When I decided to take on the challenge of running a half marathon in all 50 states, I KNEW that Route 66 was going to be my choice race of OK... I just wasn't planning on running it THIS year! Then the opportunity came up to run with BibRave and make it a girls weekend/runcation with several girlfriends from across the county, I knew it was meant to be! This race definitely has a party atmosphere! I will say that there were less spectators along the course than I would have expected, based on other reviews that I read and from what other runners have told me. I am sure the cold temps had A LOT to do with that! However, those people that were out cheering were not letting the cold get them down! They were making the most of the day, providing runners with the party they came for! There were plenty of jello shots, fireball, mimosa's, bloody mary's, tequila coffee and more! Making this race even more amazing was being able to run most of my miles with a fellow 50 State Club member and friend as he completed his 50th state and 100th half marathon! What an epic way to finish that challenge... and now I am trying to figure out if I can logistically make this happen for myself! Multiple races with options for everyone, excellent bling and a true party! Half Marathon #48, state #23 complete! Will I be back to run Route 66 again? You better believe it! 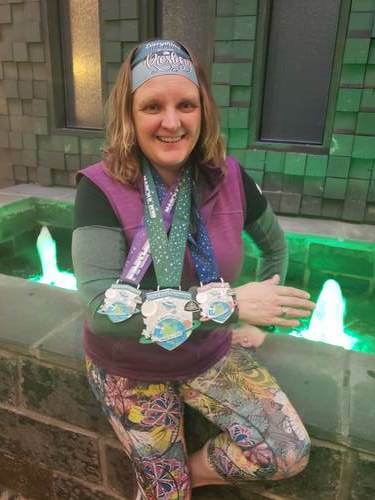 "Most scenic half marathons I've run in a LONG time!" I registered for this race at the last minute. I had 15 miles on my training plan and decided that I didn't want to run by myself. I remembered that a friend of mine was running this half marathon and decided to check it out. It was listed as a flat fast course with beautiful scenery. The price was right, so I asked her if I could tag along! It turned out to be one of the best decisions I could have made for this weekends long run! Since it was a training run for me, it forced me to slow down and really enjoy the scenery. And I am so glad that I did! The Course: We parked near the finish line in Three Lakes and hopped on a bus to head to Eagle River for the start. We were dropped off right near the Dairy Queen to a balmy 26 degrees! Yes, a little chilly but I honestly would rather run in cooler temps! They had a back check option so I was able to keep my sweatshirt with me until just a few minutes before the race. The course follows the Three Eagle Trail for the first several miles before you follow a quiet country road for the next few miles. This road featured a few small rolling hills, but nothing to get too worried about! Even though you were on a road, there was virtually no traffic, just a few dedicated cheerleaders and bundled up volunteers at aid stations or intersections. After the road, you get back onto the trail and you work your way towards Three Lakes. this was one of the most beautiful courses I have run in a long time. The fall colors were at peak color and you never knew what you would see around each corner. At one point, as I turned a corner on the trail, I stopped dead in my tracks. I felt like I was in a snow globe. The leaves were slowly falling and it was simply an amazing sight! It was moments like this that kept me going along the entire course. Again, since this was a training run for me, I was taking my time and enjoying every moment! The aid stations were plentiful, even for those of us runners that were further back in the pack. For a small race, the swag was awesome! A nice long sleeve tech shirt for all runners and then a hand crafted wooden finishers medal! I love unique race bling and this was one of the coolest I have seen in a long time! I loved everything about this race! The small town charm and the small field of runners was just what I needed after running some bigger races this year. It helped me to get back to the real reasons why I run! I spent time on the course chatting with other runners and just enjoying the day! I will definitely add this race to my calendar any year that I can fit it in!